The Keeneland Summer Select Sale is one of the top sales for bloodlines and the finest Thoroughbred yearlings money can buy. It is truly an international affair with buyers from all over the world gathering to carefully go over the horses with their trainers, blood-stock agents, breeders and conformation consultants. Sheik Mohammad is always one of the significant spenders and after the sale, he ships the long yearlings to his Kildangan Stud in Ireland to be started. After graduating from Colorado State University in of May 1992, I made my way back to Kentucky for the third summer to work at Sheik Mohammad’s Gainesborough Farm until I would catch a flight to Ireland with the recently purchased horses. In August, the horses going to Ireland were sent to Louisville to load the plane. I was amazed at how easily they all walked up the narrow ramp into the windowless cargo plane. The plane crew constructed standing stalls, three across as the horses filled the plane. The rows alternated nose or tail forward so that they were facing each other. 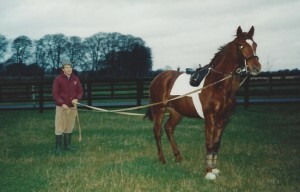 In the very front was a box stall for a mare and foal – 41 horses total. A narrow aisle ran along each side with a few rows of plane seats in the tail. A manager of one of the King Ranches and I sat in the seats. Otherwise, the only other people were grooms for the horses. At take-off and landing, the grooms asked us to stand with a row and help keep the horses calm, for the rest of the flight we were just passengers in the misty rain created by the condensation from all of the horses breathing. When we arrived in Dublin, the horses were unloaded and loaded on to several horse boxes (mid-size cargo trucks built to carry horses). We made the one hour trip south to Monasterevin, just south of the town of Kildare in County Kildare. The horses were then delivered to one of the 10 Yards (aka Barns) spread over the several hundred acres at Kildangan Stud. Upon arrival, one of the security guards asked if I wanted a lift into town to get some groceries. Soon we pulled up in front of a grey stone garage and I realized we had arrived at the shop aka grocery in the tiny town of Monasterevin! No sign, no one around, but sure enough, I went in and there was a shop keeper and one or two of a modest variety of items. One orange, one apple, one loaf of bread, two jars of jam and so on. He drove me to my new home which was a flat aka apartment at the far end on the top of the main estate home that was being renovated. 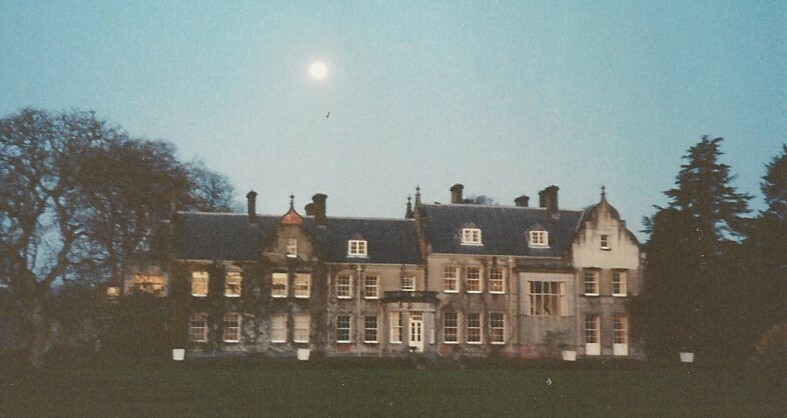 Main house – Our flat was the upper right section with 3 windows. halls and staircases of dark rooms and flapping plastic to our flat. Since that home, I have never been afraid in a house alone again! 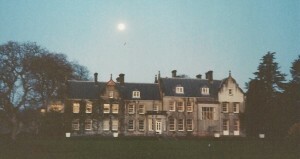 Grooms lived in various places around the Stud including the Garden House, the Gate House, the Main Yard and in a few homes grouped together. Each fall, Kildangan Stud hires help from all over the world to start the few hundred young Thoroughbreds for flat racing (horse racing without jumps). There were people from Japan, Sweden, Australia, New Zealand, Germany, Scotland, England and Ireland of course. With about forty mostly 20-somethings coming together in one place with a passion for horses, the culture was lively and social. All of the grooms were devoted and experienced horse people. Several worked or had worked as jockeys and a head trainer was always present to oversee the horses. In the first few days after arriving we were fitted for shoes by the local cobbler by them measuring and tracing our feet. We were also given jumpers aka sweaters and jackets with the Stud’s logo for work attire. Our hours were an unwavering 7am to 4pm, Monday through Friday and Saturday 7am until noon. There was of course a 20 minute tea time at 10am and an hour lunch at noon. At tea time, one was invited to the closest house or flat for a cup of black tea and lots of toast with Orange Marmalade Jam. After I had been there a couple weeks the Guarda (aka Police) somehow had been alerted that I had come over from the US and stopped by the Stud to check my passport. Each week everyone was rotated to a different Yard except the Yard Foreman’s who stayed with their horses. 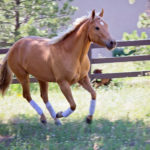 The horses were brought up from the pastures in the morning and we were each assigned certain horses for the day, told where they were at in their training and then we went to work. Not much different than what is common here, we did a lot of round pen work and slowly added tack. Different from some programs, we did quite a bit of driving from the ground (driving is the term used to drive a horse and carriage, like driving a car). 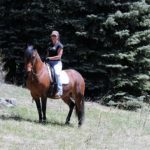 We started by double lining them in the round pen and then once they were ready, we drove them around the farm extensively to get them used to being out on their own in new surroundings before anyone was on their back. Per usual, each horse progressed at a different pace. 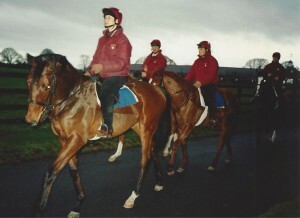 When they were ready, we “backed” (got on) them in their stalls until they were comfortable with a rider and had some steering, then they went out in groups to the gallops (the track) with an older horse aka Hunter. Like the horses in Kentucky, these yearlings were the who’s who of the Thoroughbred world. They were doted on, groomed and cared for. Some even had their own goat if they needed to have a constant companion to keep them happy. Marie in foreground riding Brigata by Nijinsky. pub. The town of Monasterevin was small with no signs that I remember, to tell someone which building was which, but it had a grocery, church and a pub. Going to a pub in a small Irish town is much like sitting in someone’s living room and sometimes it is! Most of the time there was singing by anyone and everyone in the pub and one of the favorite tunes was of course American Pie by Don McLean. The pub’s typically closed at 11pm, which was good because we had been there since 4:15pm. Fortunately, the Stud’s night Security Guard was usually sport to give us a lift home. In 1992 there were around 35 horse race tracks of sorts around the country. Some were on the beach, all were grass and most were not flat, but instead followed the lay of the land. 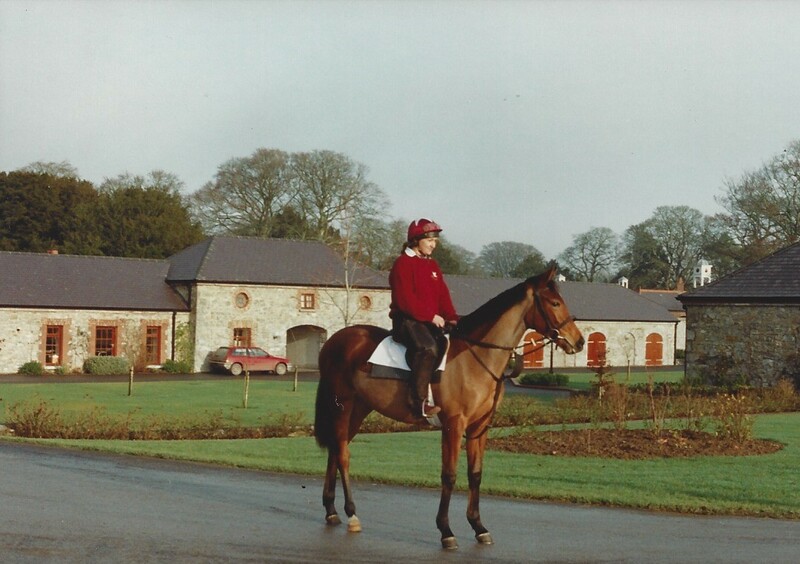 Of course many of them also had jumps for National Hunt racing (horse racing over jumps). One Saturday afternoon a few of us went to the races. Instead of going to the window to bet, a live “Bookie” stood on a pedestal next to a chalkboard with their individual odds for the horses. They had a wad of cash in their hand to take your bet and to pay out after each race. In addition to the races, four of us went on a weekend trip to Ballenasloe in County Galway on the west side of Ireland. The Ballenasloe Horse Fair and Festival is Europe’s oldest horse festival. It was an incredible scene of people and horses covering an expansive field. 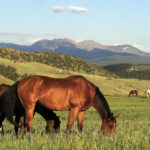 With no fences or barriers, horse shoppers wandered the field to view the horses and if they were interested in trying out a horse, one would hop on and take it for a ride. Being one of two American’s, the non-American’s decided that we should all have Thanksgiving Dinner together. One of the grooms’ family worked on a turkey farm and brought a fresh 21 lb. bird for the celebration. It was a successful feast with turkey and accompanied by mashed potatoes, gravy, steamed broccoli and carrots, pie and egg nog! No one had ever had egg nog before and they likely never did since. 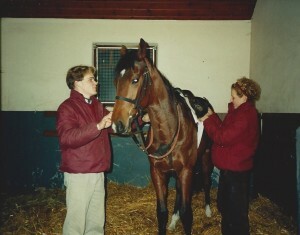 Late in the year, most of the horses were solid in their initial training and we started shipping them to different trainers in England, France and Dubai. Grooms would ride with the horses in the horse box to the airport. If the timing happened to fall over tea time, the horse box driver pulled off to the side of the road to break out their stash of tea and biscuits. Once the horses were loaded on the plane, we waited to make sure their plane took off. Interestingly we always knew which one had the horses aboard because, the passenger planes make an abrupt 45 degree angle after take-off, but the horse planes stay fairly level and gained altitude much slower.